Karnataka-based Kalkeri Sangeet Vidyalaya (KSV) is over a decade old. This non-profit nurtures bright and enthusiastic economically disadvantaged children (aged 6-23 years) residing in and around the Dharwad district. KSV is known for its uncompromising and relentless efforts to groom high quality musicians who could contribute to the diffusion of India’s vast musical heritage. KSV is perhaps the only non-profit present in the Dharwad district offering training on the ancient discipline of Indian classical music along with modern educational programmes with stress on English. KSV runs a residential school, managed largely by foreign volunteers in a quiet valley, about 40kms away from Dharwad. The residential school, spread across five acres of land, functions like a traditional Gurukul where teacher-student stay together and follow a low-profile lifestyle with classrooms made of bamboo, clay bricks and timber. Food, shelter, clothing, books, musical equipments, basic healthcare services and accomodation are all provided free of cost. Academics with emphasis on Performing Arts, along with strong focus on English language are the key tools used by KSV to empower children so that they can find it easier to earn a livelihood. KSV is profiled by the Centre for Education Innovations, an international body that promotes programs, policies, and practices that increase access to quality, affordable, and equitable education for the world’s poor! On the acedemic front, about 99% of students at KSV pass with an average marks of 70% each year. On an average, about 15-20 students pass out each year from KSV. In the initial years, around 5-7 students passed out each year. KSV has continued to maintain an impressive job placement record of 100% since inception. Artists are encouraged to participate in several performing arts events at the state and national level. This has helped KSV produce some of the best artisits from among their students. Besides positive progress in education and performing arts, KSV’s healthcare department succeeded in improving the Body Mass Index (BMI) of 200 students children enrolled in FY13. 90% of students’ BMI improved in FY13 v/s 80% in FY12. During our visit to KSV, we were overwhelmed by the outstanding performances by extremely talented young artists. Every child at KSV was confident, well-mannered and spoke fluent English. The staff was committed and volunteers extremely passionate about the programmes. Most improtantly, teachers and students shared a very healthy relationship and the impact was evident! In FY13, KVS earned a total income of Rs7.1mn v/s Rs5.4mn in FY12 (+31% Y-o-Y). The rise was owing to 36% and 29% Y-o-Y increase in general donations and foreign income respectively in FY13. Total income has been largely dominated by the contribution from foreign sources since inception. In FY13 foreign donations were 83% of total income and it averaged 84% during FY10-FY13. KSV spent 75% of total expenses in FY13 on direct program activities, which is in line with the average of 77% for between FY10 and FY13. 75% spend includes: 31% on program activities, 40% on program salaries and 4% on travel cost. All these have been in line with trends observed in the last 4 years. Fixed Assets (FAs) were valued at Rs2.6mn (Rs1.3mn in end FY12). This was on account of purchase of Musical instruments, a sound system and instrument storage cupboards. Musical instruments and a vehicle for local transport, together forms the major part of Fixed Assets i.e. 57% of total. 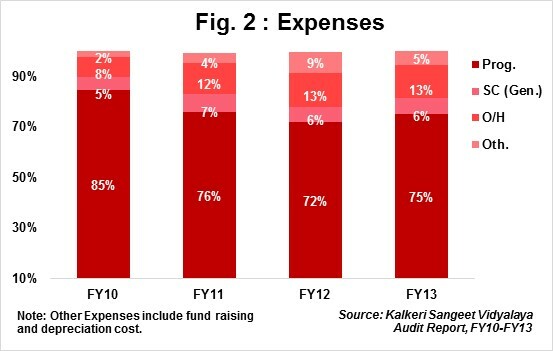 During FY13, KSV was successful in raising funds towards its corpus. The corpus increased substantially from Rs59,534 in FY13 to Rs1.2mn in FY13. KSV posted a 4-year total income CAGR of 25% for the period FY10-FY13. 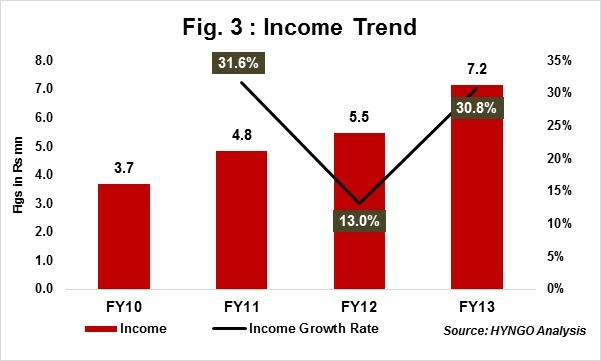 The Y-o-Y income growth dropped from 31% in FY11 to 13% in FY12, dragging down the 4-year income CAGR. However, the drop was compensated by the growth in the following year. 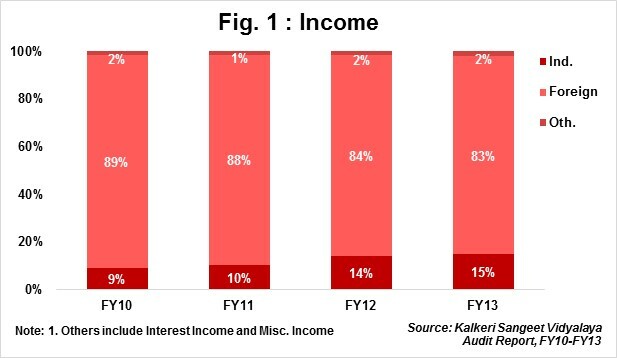 Self Sufficiency Ratio (SSR) which indicates an organisation’s abilty to meet its expenses from its own income stood at 20% in FY13; suggesting low income from own sources like individual domestic donors, service charges, interest fee. Since KSV’s model is to offer free services to its beneficiaries, it is important for KSV to generate alternate sources of income that would make them self-sustained. Committed Donors include Deshpande Foundation, Rotary International, The Teacher Foundation, Namaste Association, Young Musicians of the World and International Roncalli Foundation. Limited reach. Despite the Y-o-Y increase in applications from students, KSV can accommodate only about 200 students at a time. Therefore it limits the new addmission to about 20-30 students a year. KSV is looking out for additional space in the same valley to expand its capacity. Although, the volunteer model is KSV’s biggest strength, it is one of the major inherent risks KSV carries. This risk is because adjusting with new volunteers after every 6 to 12 months may affect their learning curve and cause inconvenience to students as they adjust with the newer volunteer-teachers. To mitigate this, KSV has started inducting local teachers. Three of the four founding members are related to each other. Mr. Mathieu Fortier and Mrs. Agathe Merisse Fortier are married to each other; whereas Mr. Blaise Fortier and Mr. Mathieu Fortier are brothers. All three founders have traveled extensively across India and have learnt three regional languages so that they could connect with the potential beneficiaries and the community. Mr. Ustad Hameed Khan, the fourth founding member is a sitar player and a master performer of his instrument. He nutures and mentors the students interested in music. Mr. & Mrs. Fortier operate from Canada, but frequently visit the KSV campus. None of the four founding members are actively involved in the operations of KSV. The Board Secretary, Mr. Adam Woodward, has been running the show at KSV, both on the operational and development fronts with the help of dedicated foreign volunteers and local staff. He has been associated full time with KSV for almost 11 years now. KSV is goverened by nine committee members who meet thrice in a year. Quorum for a board meeting is 5 and others are often connected virtually. KSV is a transparent non-profit and have meticulously shared details of all expenses incurred project-wise. Annual Reports are very well structured, comprehensive and convey the impact made in each financial year.